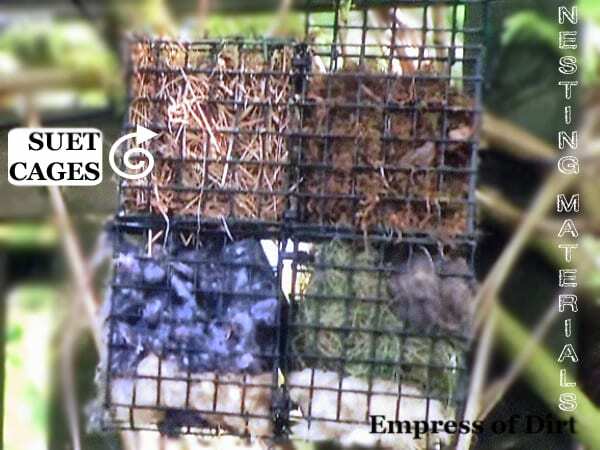 If you wish to put out nesting materials for wild birds, do your homework first and be certain that they are indeed safe and beneficial for the birds. For more, see how to make bird feeders from repurposed water bottles. I’m always looking for ways to not only encourage birds to visit my garden but to make them comfortable enough to stay a while. To feel secure, birds like access to trees, shrubs, flowers, and any other items they can safely perch, hide, rest, and nest upon. Besides providing various types of bird feeders, seed, and water, you can also offer nesting boxes and nesting material. As mentioned, this idea requires research first to ensure anything you offer is safe. Birds may be attracted to things like yarn that, if the pieces are too long, can become entangled on their feet and cause terrible problems or death. Please take these ideas as suggestions to be investigated only. After years of doing this, my advice is to stick with all-natural materials. I look up my questions at the Cornell Lab of Ornithology and do other research until I’m satisfied with the information. But, that said, things change as we learn more about birds. This spring I’ve been putting out various nesting materials free for the taking. 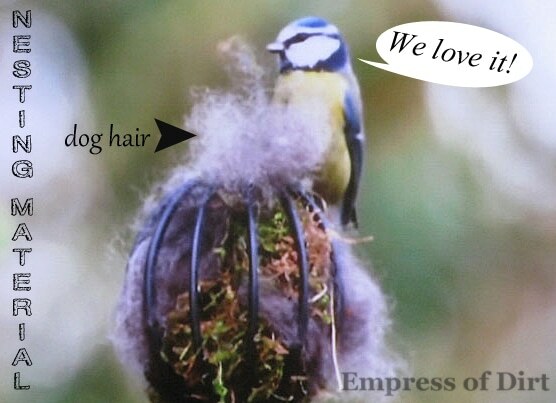 It’s quite fun watch a bird come along, and gather a bundle of dog hair to include in their nest construction. I also collect small sticks and twigs, which I keep in a bug hotel, and these are often used by a variety of animals including birds and squirrels. There are have been too many reports of yarn and ribbon getting tangled around bird’s feet so these are no longer recommended. I first got this idea while watching the BBC show Gardeners’ World during a segment featuring Wildlife Kate. You can see her website and bird cams here: http://www.wildlifekate.co.uk/ . She’s got a garden packed with ideas for keeping the birds and other wildlife happy. No matter what, please make choices you know are safe for the birds and when in doubt, just leave them be. I love my birds in the winter I feed so many. I have barn swallows in the barn in the summer I never would have thought of the whiskey of material for them I would like anything that would help me do something to help them.Thank you so much I’ll try it this year. 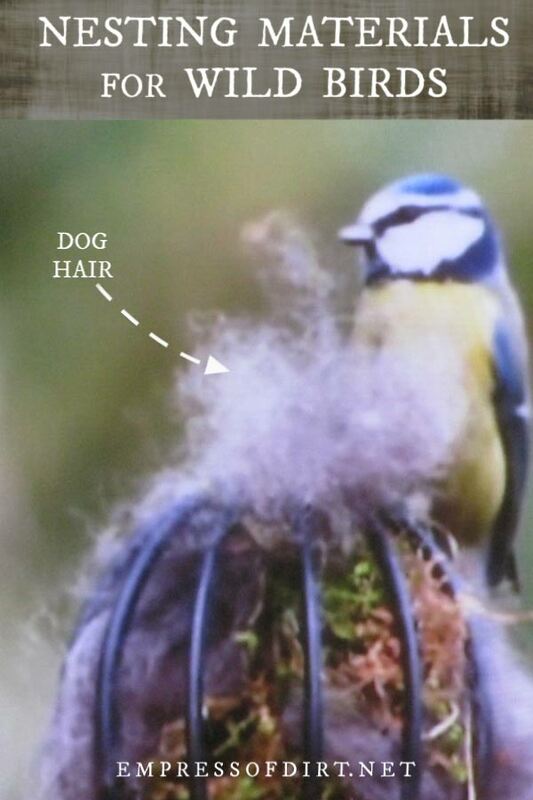 You’ve mentioned dog fur as bird nesting material. Is cat fur also acceptable? Or, is it somehow offensive(smell, dander, coarseness) to birds? Also, as funny as it sounds, what is a “bug hotel”, as mentioned in nesting materials? I have just come across your site, and I am anxious to start my 7year-old granddaughter on this project this spring. She’s always loved birds. When she was a toddler, she’d “call” to birds everywhere, and they actually seemed to be drawn closer to her. I am going to introduce her to your site as well. Thank you. Great questions, Bonnie! Cat fur may be unattractive for birds for the reasons you name but the main reason it is not recommended for nesting material is because it is not pliable like dog fur is. I learned this years ago when taking a spinning and weaving course: some types of dog fur (like husky) can be spun into yarn, but cat hair cannot. So, it makes sense that it’s not really useful for birds because it can’t be bunched up and added to a nest. Instead the single hairs would just float away. 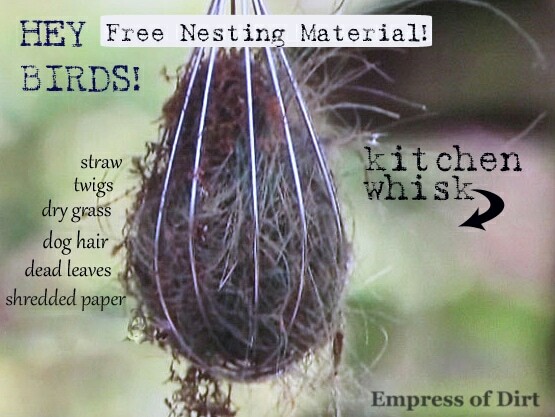 I wonder, with so many nesting materials available in the natural environment, how do the birds even find your little nest material offerings? Do you place it close to a birdfeeder, house, or birdbath? We have a bird nesting in our birdhouse this year (finally) and the kids are very excited about the prospect of putting out nesting materials… so maybe we’ll give this a try next spring. Thanks for sharing. I have Cairn Terriers so they provide great hair for our birds. I do not use *any* flea killing treatment on my dogs so their hair is safe to use. I spread hair on a bush in our dog run and the birds find it incredibly quickly. I also leave some hair on the ground. By the next morning the bush and the ground are totally hair free so I use my Mars grooming tool to get a new supply for the birds. Please note that you should never use the hair of a dog treated with Frontline or Advantix. The pesticides stay on the fur and are harmful to baby birds. Hi! I’m searching the web for nesting material. I plan on providing my garden birds with not only food this coming winter. I have 3 bird caches up, but plan on bying some roosting pockets off ebay. The caches are currently emphty, not so nice as it will be cold. So off to get some nesting material. Maybe from my sister’s dog!! But, what about the material getting wet when hanging outside…. ?? What’s your take on that? Just a tip I know from raising canaries: if you put out yarn or string for birds, you need to make sure the threads are all separated from each other, otherwise the birds’ feet can get caught in the threads that make up “yarn” and “string”. Melissa, This is such a wonderful idea. I am always amazed at some things our members come up with. Love this whole idea. Thank you. It’s really fun when you get to see something you put outside actually made into a nest!